Baffle: Pieces of fabric sewn across each corner of a tubular or four – panel bag. The baffle will improve a bag’s squareness, appearance, improve stability of the load and more efficiently utilize storage or shipping space. Bag Height: Height dimension of an FIBC measured from the top seam to the bottom seam. Belt Patch: A piece of fabric sewn either between the main fabric of the bag body and the lift belt, or on top of the lift belt, within the belt sewn portion, used to improve sift resistance and/or the safe working load (SWL). Bias Strap or Tape: Made of multifilament yarns, (MFY), polyester or polypropylene, and used to tie inlet and outer spouts. Also called a Web Tie or Tie Strap. Body Fabric: Main fabric used on the body of a u-panel, four panels or circular bag. Bottom Fabric: The bottom material of a tubular or four panel bag. Bottom Spout: Also called a Discharge Spout, used as an outlet to empty the contents of the FIBC. Breathable Fabric/Bags: Uncoated or non-laminated fabric/bags. Circular Woven Bag: Also called a tubular bag, it is made from fabric woven on a circular loom, which is then cut to the proper length for specified bag height, thereby eliminating the vertical seams on each of the bag’s sides. Cone Top: A variation of an inlet, where the top is a pyramid-type to allow over filling of the bag. Also called a conical top. Coated Fabric/Bags: Fabric or bag which is coated/laminated with polypropylene (PP) to prevent moisture intrusion or sifting of the contents. Also called non-breathable or laminated fabric/bags. Cord lock: A closure device to hold the rope or cord in place on the spout – typically used on the discharge of bags. They come in a variety of sizes and eliminate the need for hand tied knots. CROHMIQ®: Static protective fabric for Type D FIBC is designed and engineered to operate safely in the presence of flammable or explosive atmospheres without the need for a ground connection. Denier: The weight of yarn in grams per 9,000 meters. Discharge Spout: Also called a bottom spout, used as an outlet to empty the contents of the FIBC. Drawstring Closure: A type of spout construction similar in purpose as to a petal closure, but with the loop/string along the circumference of the closure. Duffel Top: A type of FIBC similar to a duffel bag whose inlet extends from the top seam and follows the bag’s base dimensions. Extended Belt: A type of FIBC construction where the belt extends around the bottom of the FIBC. This construction is not applicable for U-Panel FIBC’s. Fabric Mesh: The measure of the density of the fabric weave, measured as the number of yarns per inch in both the Warp and Weft directions. A typical construction is a 12 x 12 mesh. Fabric Weight: The measure of the fabric weight in ounces per square yard or grams per 100 square centimeters. A typical standard weight is 6.5 oz./sq.yd. FIBC: Flexible Intermediate Bulk Container. Fill Spout: Also called an inlet spout or top spout, used as the inlet for filling an FIBC. It is designed to fit the customer’s filling chute during loading. Filler Cord: Typically a polypropylene material used in manufacturing sift-resistant FIBC’s. A rope or braided yarn-like cord that is sewn into a seam to help prevent the escape of fine dusts and powders. Form-Fitted Liner: Designed to take the exact shape of the FIBC. Form-Fit Liners will allow improved filling and complete discharging of product. Unlike a basic “tube liner”, Form-Fit Liners offer a flat top and bottom and incorporate a spout diameter and length to best compliment the FIBC’s fill and discharge spouts. These spouts can also be healed closed for added sanitation and protection. Form-Fit Liners are available in a variety of standard and co-extruded Polyethylene’s, including barrier and anti-static features. Form-Fit Liners can be affixed permanently to the FIBC by gluing or sewn tabs can be designed to be easily removed from the FIBC with ties on the tabs. Full Open Discharge: A type of discharge whose outlet extends from the bottom seam and follows the bag’s base dimensions. Also called a Full Open Dump. Hem/Hemming: A fold and sew, or glue operation, which prevents fraying of cut fabric and will add lift strength and seam strength to each bag. This also provides a clean finish to the FIBC. It may be either towards the inside or outside of the bag. Hose: An accessory often used on a petal closure to facilitate tying it off. This may be either polypropylene or polyvinyl chloride. Lay Flat Width: The width of tubular fabric if stretched or laid flat. It is twice the width of one bag side; i.e. a 35×35 bag would have a LFW of 70”. Lift Belt: Also called a lift or fitting loop, supports the overall Safe Working Load, (SWL), of a filled bag during handing & transport. It may be made of either a stiff strap or soft strap. It can come in various widths and strengths and should be specified in each bag specification. Typically lift loops have a tensile strength between 3000 and 5000 pounds. Loop Height: The free or open loop height measured from the bag top to the middle of the free end of the link belt. Main Fabric: Fabric constituting the U-panel of a sewn bag. MFY: Multi-filament yarns used in the weaving of bias tape/straps and lift belts. May be constructed of polypropylene or polyester threads. Multi-Trip FIBC’S: Bags designed in accordance with British Standards requiring a 6:1 Safety or Service Factor (SF). Note: Most manufacturers do not offer any guarantee or recommendations for multiple uses of bags. Since the inspection of the used bags is beyond the control of the manufacturer, they have no way of knowing if a bag is damaged in its initial use. For additional information regarding multi-trip bags, reference ISO 21898. Perimeter Belt or Band: Bias tape/strap sewn around the top seam as a reinforcement or identifying mark, occasionally referred to as reinforced or ring around top (RAT). Also known as Safety Belt. This belt is most important if the bags are to be picked up on less than all four loops. Petal Closure: A four-petal like spout construction used to hold in the spout during transport. Petal-Type Patch: A type of petal closure that is separate from the bottom fabric used to hold in and protect the spout during transport. Also referred to as reinforcement square. Polyester: A type of polyester often used in producing multifilament yarns and threads. It is typically not easy to recycle with a polypropylene FIBC, since the polymers are virtually incompatible. Polypropylene: A type of polymer used in producing monofilament and multifilament yarns and threads. It is recyclable and is used as our standard fabric and most threads. Port Hole: A type of outlet construction without a spout. The hole cut is reinforced with bias tape/strap. Reinforced Section: Section of the FIBC where the lift belt is sewn onto the fabric. This section of fabric has twice as many Warp yarns, which contributes to the strength of the bag. It is also called a Tramline. Remote Open Discharge (R.O.D. ): A type of outlet that has provisions for discharge of material without an operator reaching under the bag to open the spouts. Safe Working Load: SWL is the amount of load, (in pounds or kilograms), which a bag is designed to carry. Note: Most customers use the metric system where 1 ton equals 2205 pounds or 1000 kilograms. Safety Factor: Also referred to as a Service Factor, it is an industry standard requiring the FIBC to handle five or six times its Safe Working Load (SWL), normally written as a ratio; “5:1 or 6:1 SF”. Sanitary Flap: A bottom diaper that protects the entire bottom surface of the bag for cleanliness and wearing. May also be referred to as a protective bottom. Seam: A sew line made by the attachment/assembly of two or more components. Side Fabric: A fabric component of a sewn bag style of construction. This can be either two pieces attached to the U-Panel, or four pieces, which form the Four Panel bag. 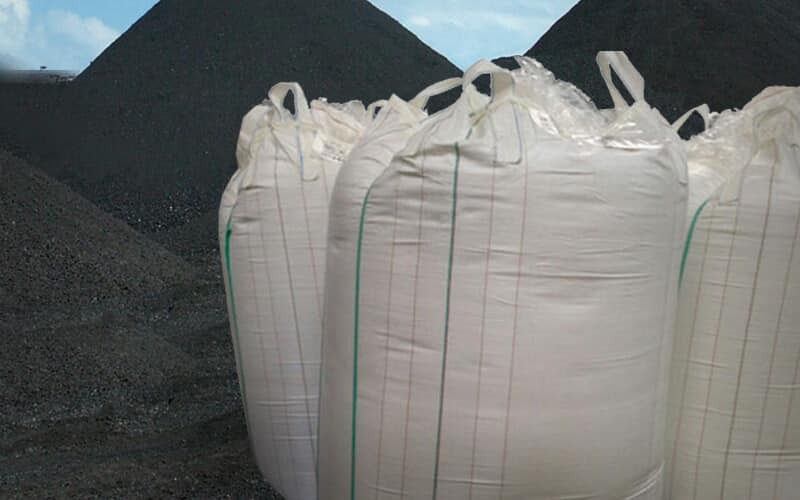 Sift-Resistant Construction: A feature of an FIBC that provides resistance from product sifting when the bag is filled with very fine materials. Also referred to as “Sift proof” construction. This typically utilizes coated fabric and filler cord in the sew lines. Single Trip Bag: An FIBC designed in accordance with British Standards or ISO 21898 requiring only a 5:1 SF. Soft Strap: A lift belt made with polyester or polypropylene multifilament yarns. Spout Cover: Also called a petal cover, it is a piece of fabric material sewn between the spout and the petal closure used to hold in/protect the spout. May also be referred to as a “pancake” due to the round shape commonly used. Spout Diameter: A dimension of the spout measured across the circular opening. Spout Height: Height dimension or length of the spout measured from its point of attachment on the top/bottom fabric to its free end. Stevedore Strap: May also be called a Connecting Belt, Rope, or Strap. It is a belt connecting either two adjacent lift loops, or two adjacent belt sewn portions, used for single point lifting. A belt or strap is usually flat, while a rope is braided. Many people use this term loosely, so it is useful to clarify this point – including the required length. Stiff Strap: A type of lift belt made of multifilament yarns as weft and polypropylene yarns as warp, allowing it to stand more upright on the filled bag. Top Fabric: The top fabric used on a FIBC. This is often a lighter fabric than the main (body & bottom) fabric as it has much less stress or load bearing responsibility. Tube Liner: A polyethylene liner with no spouts or contours, it is a straight cylinder, which may or may not have one end heat-sealed. This low cost liner can be installed in the FIBC loose or by gluing or by sewn tabs. Also called a Tubular Liner. UV Stabilized: A feature of an FIBC fabric that provides protection from prolonged exposure to the sun’s degrading UV rays. An additive is added to the resin prior to extrusion of the yarns to provide this protection. Volume: The size, or amount of material, an FIBC can hold. It is generally measured in Cubic Feet. Warp: Yarn or tape in a fabric, oriented perpendicular to the Weft yarn during weaving. This would go from top to bottom in the body fabric. Also identified as the yarn in the “machine direction”. Web Tie: Made of multifilament yarns, (MFY), polyester or polypropylene and used to tie the inlets and outlets. Also called a Bias Strap, Tape, or Spout Ties. Weft: Yarn or tape in a fabric, oriented perpendicular to the Warp yarn during weaving. This would go from left to right in the body fabric. This is identified as the yarns placed by the bobbins of the looms. Yarn/Tape: Extruded PP sheet slit and stretched in annealing ovens to form part of the woven fabric for the FIBC.